The Swiss Miss represents the L.P.S.S. at many area events and local parades. 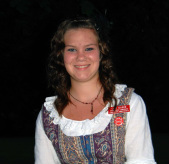 A Swiss Miss is crowned annually during the Oktoberfest dance. If you are interested in running in next year’s competition, please contact Heidi Werner, Swiss Miss Manager, at werner_1976@hotmail.com as soon as possible. Completed applications must be received by June 1st, 2018 to become a candidate. 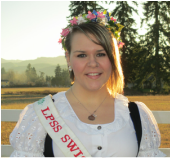 All Swiss Miss candidates receive a lifetime LPSS Membership and 15 to 25 percent of their button sales. Those that sell over 800 buttons are also eligible for a $200 scholarship. Candidates need to be a member, have a parent that is a member, or be sponsored by a member.